Han Solo of Star Wars could learn a thing or two from Firsten Guide, the tough, wise-cracking rebel leader who’s light years ahead of his time- and about to lead his crew into a battle that’s Beyond All Weapons. Because the force is most assuredly with Firsten. He and his fellow colonizers of Mars have faced a brutal crackdown engineered by Earth’s tyrannical government. But the resourceful Firsten has developed an extraordinary new fuel that enables him and his hardy band to escape into space- and time. Escape, however, is not enough. Firsten wants revenge. But the universe is full of unexpected twists and turns. Just as Prometheus flew too close to the sun, Firsten will soon discover that when you break the laws of physics, you can get burned. Hubbard was a pioneer in his use and development of Einstein’s theories of space and time as a plot point in his fiction. 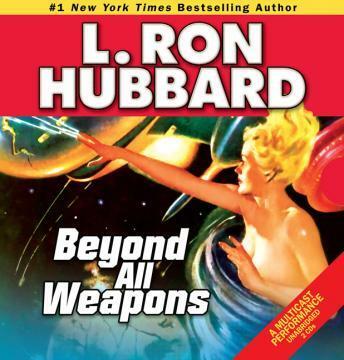 In Beyond All Weapons, he explains: As mass approaches the speed of light . . . it approaches infinity. And, as mass approaches infinity, time approaches zero. It was only nine days back from Alpha. But in those nine days, six thousand years have passed by Earth. It stands as one of the earliest- and most succinct- descriptions of the theory. Also includes the science fiction adventures Strain, the story of a space war’s brutality and one man’s struggle to keep a secret under the pain of torture, and The Invaders, in which the distant crystal mines are under attack until a technician crystallizes a unique strategy to undermine the attackers. A thrilling space adventure . . . the terror and excitement builds through to the end. - P.W.